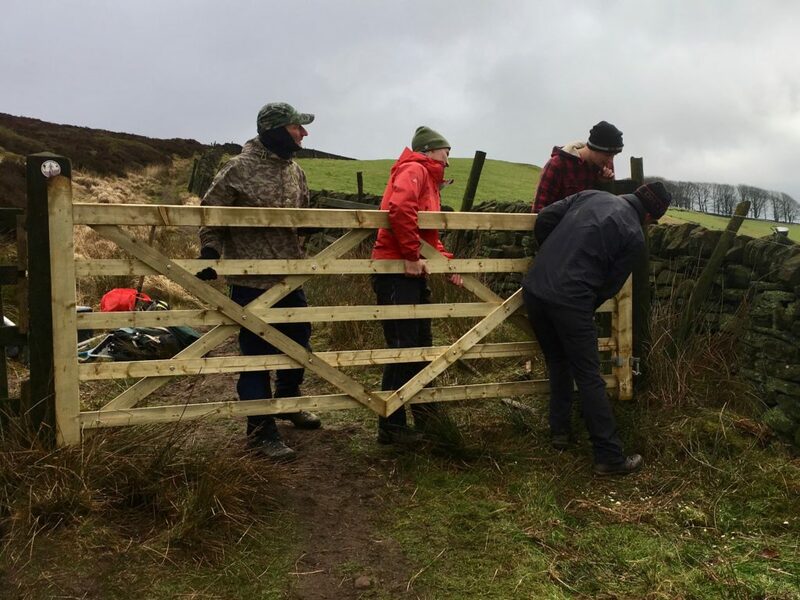 Our 2019 program of trail maintenance at the Roaches kicked off on Sunday February 10th. Working with Staffordshire Wildlife Trust and Peak District MTB volunteers, we has a constructive day despite the foreboding weather first thing. We worked mainly on the new permissive High Forest cycleway, fitting a new gate where the previous one was rotten and damaged. The Roaches is a wildlife reserve, and gates are critical for keeping grazing animals where they are needed to control the vegetation. Carrying the old gate back up the hill was a good workout too! We moved on to the Gradbach permissive bridleway to clear the reeds. The original line has become overgrown and flooded over the years, and the reeds contribute to that. By clearing the vegetation and drains, we can encourage the surface water to drain onto the adjacent field (where it’s wanted). 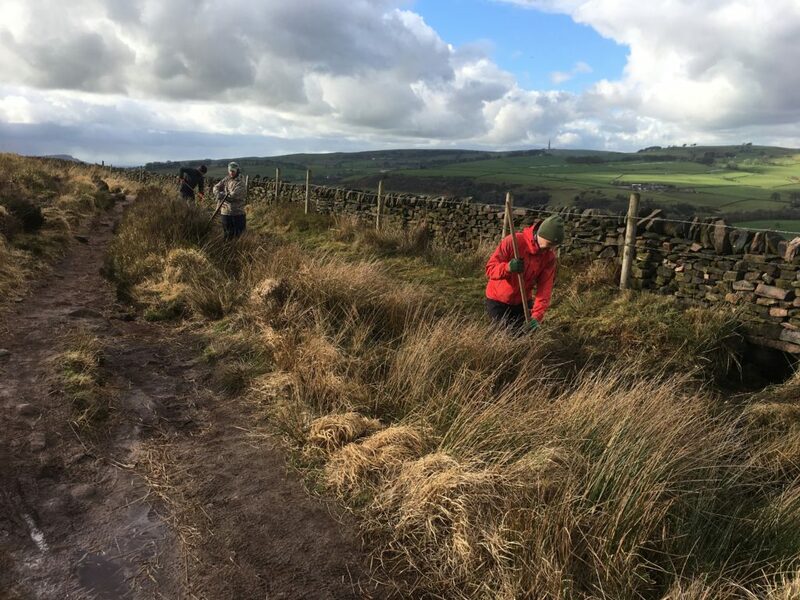 This helps us reinstate the original permissive bridleway line, saving the higher moorland from the passage of feet, tyres and hooves. This was one of the key problem areas we highlighted in our proposal to Staffordshire Wildlife Trust a couple of years ago, when this trail had a 70m flooded section. It’s great to see such positive progress. We also had chance to check on some of our drainage work on this section from last year. I’m happy to say all was looking good and working as expected. 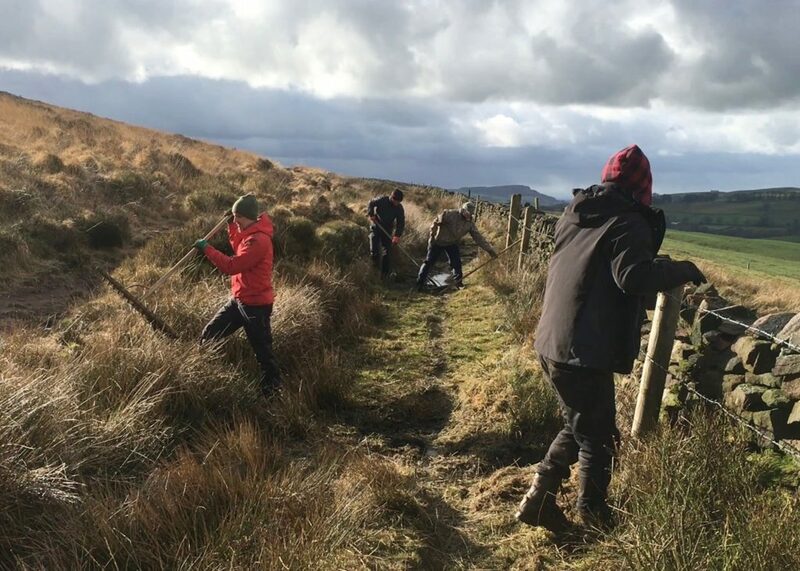 Thanks to our volunteers for braving what was a pretty grim weather forecast, only to be surprised by mild and dry weather (other than the hail storm at the end of the day!). Future trail maintenance days at the Roaches will be monthly, usually second Sunday of the month. Keep an eye out on our website, Facebook or Twitter for confirmed dates, or email Dan for more info. Even better, join us as a member to receive our newsletter and help us have an even louder voice in Peak District advocacy work.